OSRCon is this coming weekend and, like last year, I'll be running a couple of sessions for folks interested in exploring my Dwimmermount megadungeon. 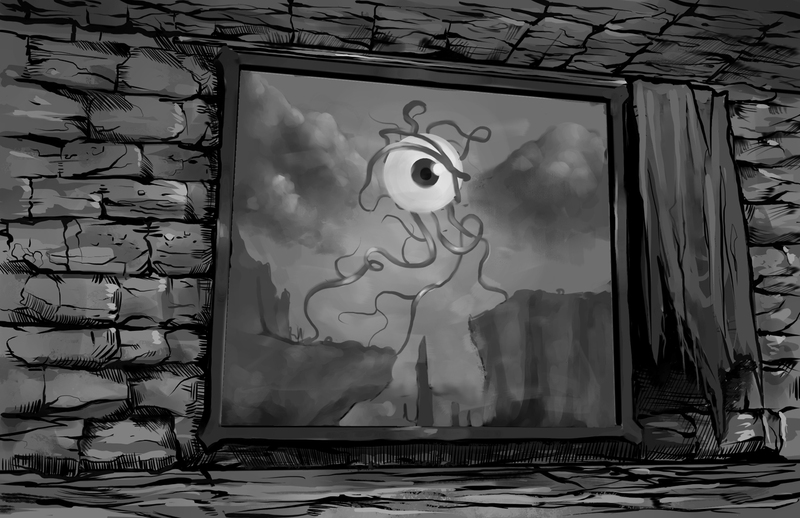 I really enjoy doing this, because it's great fun to see how players who've never had the chance to delve into this megadungeon react to its inhabitants and mysteries. It's also great to see how I react to new players. In the four years since I created Dwimmermount, I've played with quite a few different groups of players. There's my home group, of course, but there are also gamers I've met at OSRCon and through Google+ (where I'm still running sessions biweekly, when real life doesn't prevent me from doing so, as it did recently). Though there are some players who carry over from one group to another, there are also a lot of new players, so they're experiencing the dungeon for the first time. So, not only are its chambers and monsters and traps fresh to them, they're also bringing with them different expectations about what Dwimmermount is like -- and those expectations color the way the interact with the dungeon. Those expectations also color the way I present the dungeon. 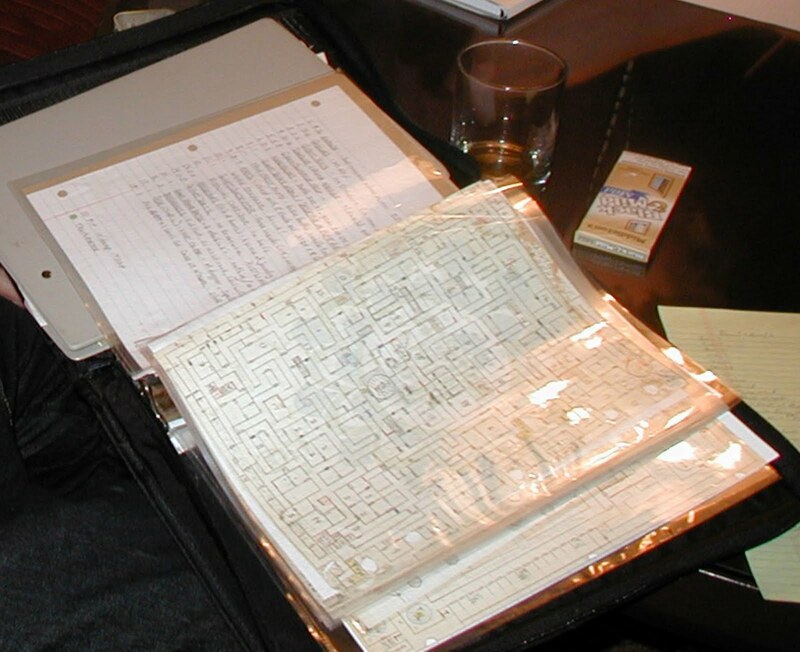 You've probably all seen this photograph of Gary Gygax's map and key to the first level of his Castle Greyhawk dungeon, right? What's noteworthy about that photo, aside from how labyrinthine Castle Greyhawk appears to be, is that Gary's key is incredibly sparse by the standards of published dungeons. I suspect (never having had the pleasure of playing with him) that Gary probably used that key as a starting point for describing Castle Greyhawk rather than as a definitive presentation of the dungeon itself. It's a combination of snapshot and mnemonic device to aid him in his refereeing. And while I am sure that many details of Castle Greyhawk remained the same no matter who Gygax was running through it, I also suspect that some details changed, or were at least presented differently in response to how his players reacted to what they encountered. To the right you'll see a small portion of my horribly scrawled original notes for Dwimmermount. They're what I used when I first started to run the dungeon for my home group and they're still what I use when I run the dungeon at cons or on Google+. You'll notice that they don't contain a lot of information, often not even game stats. So you'll see "Junk" or "7 Orcs" rather than anything more extensive. I'd be lying if I said I wrote my key in this way for a principled reason. The truth is I was lazy and figured I'd add details later, as needed. After all, what was the point in writing up an exhaustive description of a room that contains only debris -- especially if the players never explored the room at all in play? This has had two interesting side effects. Firstly, I never run Dwimmermount the same way twice, at least not exactly. The key says that Room 62 is an "audience chamber" with "throne, etc." and nothing more. In play, I always expand upon this description, adding as much detail as I think the current players desire. So, I'll almost always say that there's a wooden throne upon a dais in the room, along with some other trappings of authority, like rotting tapestries and the like. How much more I say beyond that depends on how interested my players seem to be in the room and its contents. In some sessions, I've described the throne in great detail, talking about the carvings upon it, as well as its current state of repair. In other sessions, it's the tapestries that get this kind of treatment, while in others still I may make note of something else entirely, like some broken spearheads in the corner of the room or a shattered shield. In each case, though, my description is based on my perception of the players' level of curiosity and interests. My various descriptions are probably all consonant with one another, but the words I choose to use vary, often considerably, from group to group. Secondly, the process of converting my key into something useful as a published product has proven a far more irksome one than I had ever imagined. Mind you, I'd anticipated this problem years ago and so have no one to blame but myself. But the point remains: translating sparsely worded notes into something that not only makes sense to others but is thoroughly usable by them is harder than it looks, particularly when one has, as I have, come to appreciate firsthand the benefits of sparseness. Having run many levels of Dwimmermount numerous times with groups of different gamers has taught me to find liberation in a certain degree of vagueness, as it gives me flexibility to tailor the dungeon to whoever is currently sitting at the table with me. Though I have no proof of this, I have begun to suspect that a sparse (and flexible) key is the sanest way to run a megadungeon, unless one is possessed of a uniquely powerful memory. With so many rooms on each level, many of which will be empty or at least without any contents of significance, does it even make sense to have highly detailed descriptions? I think the same can often be said of many rooms with inhabitants or other contents of significance. Needless to say, the process of turning my own megadungeon into a form for others has been -- and continues to be -- a learning experience. Those are some nice insights (esp., difficulty of turning sparse notes into published product; very similar to what Gygax said regarding trouble getting Greyhawk produced), thanks for that. I would say the way you key dungeon rooms is an old idea and yet very new too. Gygax did it, the "One Page Dungeon" contest entrants nearly all do it, and M. Curtis' "Stonehell Dungeon" (as an example) also uses the abbreviated room descriptions. I personally like it a lot, others not so much, but what better way to provide pertinent information of a rooms description without having to read a, possible, lengthy, text block. With my limited time to read through an adventure/module this kind of set-up allows DM's to run games well on the fly or with just a read through and to accomodate whatever situation/plot is going on with the current party. If you have run the megadungeon several times with different people how do you keep track of changes that happen to the environment? Do you have one "live" version of Dwimmermount where Group #10 can encounter the corpses of the TPK the group #5 suffered? If you have just one version how do you make sure that the sparse "audience chamber" with a "throne" doesn't contradict what went before? 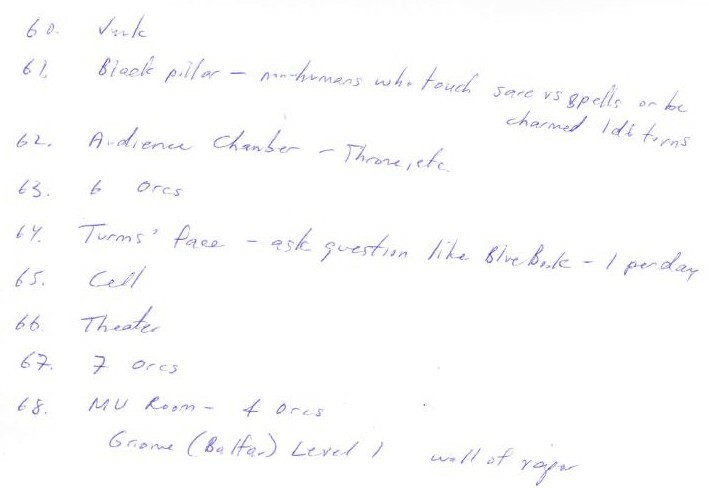 I'd pay good money for simple photocopies of Gary's Greyhawk notes. Converting those notes to a "publishable" format (such as Castle Zygag) fundamentaly alters the setup to where you're really playing something else. I don't see the point. I think the reason sparse notes works is because it is your dungeon. When you designed it, you picture a "junk room" in greater detail, whether consciously or subconciously. The brief notes then jog your memory as to the intent of the room. For a published product, the DM did not design it and does not have the benefit of that designing stage, hence the need for more detailed notes. That's really interesting. I recently read a mammoth history of classical music, and it's clear that music notation has taken sort of the same path, starting out just as a mnemonic aid to the performer and ending up being an intricately designed object that becomes, to some, more important than the performance itself. When I was a kid playing 1e AD&D and designing my own dungeons, all I had to go on for models was existing modules, so I felt the need to write everything out in the same level of detail that I saw in published products, which slowed me down ridiculously and probably prevented a lot of fun. In retrospect I really wish the rulebooks had presented sample dungeon notes that were as sparse as yours and Gygax's. One of the challenges I'm finding with such terse notes is consistency. When the PCs return later, they reasonably expect things to be the same (barring third party action). If the throne is ornately carved wood today, it probably shouldn't be rough cut stone tomorrow. I find myself scrawling a lot of increasingly incomprehensible notes as I go, and still don't always capture all of my on-the-fly decisions. It seems like doing more prep work would solve the problem, but at the obvious cost of increased prep work. So for now I muddle along. There are two "live" versions of Dwimmermount -- the one from my home game and the one from my current G+ sessions. The Dwimmermounts from cons and those from older G+ sessions exist in their own little continuities without any real interaction between each other or the two live ones I mentioned above. I do sometimes add details from one live version to another one, but not always. As for keeping the details straight, I have a pretty good memory, so it's not as hard as it might seem. A shorthand description works best as a reminder of a full description. An adventure with only jottings is conceptually bare. Kind of "first-stage" developmentally. 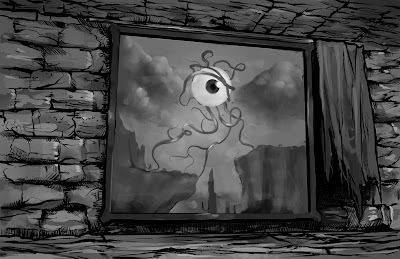 The best adventures are replete with concrete features PCs must interact with: think of Tomb of Horrors, Tamoachan, In Search of the Unknown. None of these dungeons is sparse. Going into them means being immersed in details and having a surfeit for the imagination. They are vividly-imagined environments that are engaging and interesting. I don't see how megadungeons should be any different. 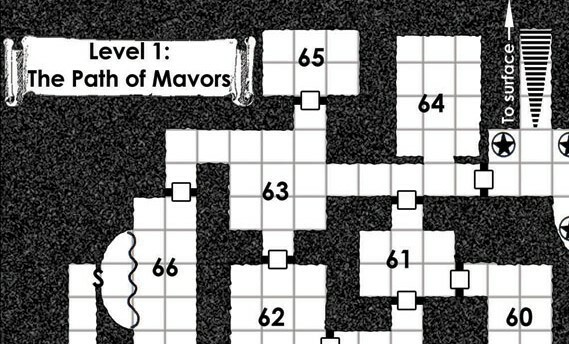 Once a dungeon level has been fully imagined and developed, then, and only then, should the short-hand come in, and only for utility in game play. Decades ago, I wanted everything spelled out. Eventually I realized that when it came to actual play around the table, I wasn't using 80% of what was printed in the module anyway, either because it didn't fit the moment, the players never bothered with it, or I simply forgot to include it in my description because my brain was overwhelmed by details. Now my attitude is that the goal isn't to be specifically short or long, detailed or sparse, but to state exactly what must be stated and nothing more. Much of what goes into long descriptions in published dungeons is unnecessary. It is red herrings (which players supply in droves by themselves) and mood (which DMs can and probably would rather supply to suit their own taste) or is there only for the reading enjoyment of the DM. A short room description leaves me free to be a storyteller during play, rather than a script reader. In my half-page Adventure Notebook dungeons, the format is so unforgiving that rooms must be about one simply conveyed idea. Different DMs have different styles and what suits one won't suit all, but this minimalist approach suits me. That's another wonderful piece from Eric. The book is going to look wonderful. Any way to get in on the G+ game? I think I've been most successful at actually getting games going when I stayed on the sparse side, saving elaboration mostly for things that need it, like the spells of NPCs and details of interesting magic items that the characters will use for awhile. A standard of long descriptions makes it daunting to do the next one and the next one after that. I have trouble even reading a lot of long published materials with huge stat blocks. I'm just struck at how evocative that lead in picture of the map is... my memory cogs are greased and it takes me back to the Red Box. So glad to be a backer on Dwimmermount. 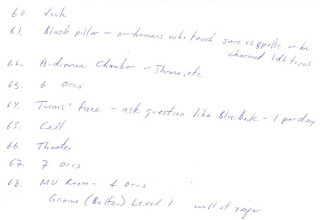 I have never seen that picture of Gary's notes on Castle Greyhawk. While you aptly focus on the post's topic (notes and mapping), I'm struck by the Old Fashion glass with what appears to be a reminder of scotch/whiskey and the Black&Mild (a brand) cigars.